Successful campaigns have great stuff for backers to buy. Kickstarter calls them “rewards“, Indiegogo calls them “perks“. Whatever you call them, do this: offer stuff that people want, at a price they’re willing to pay. Crowdfunding is not money-for-nothing, it’s money-for-something, and you’ll want to offer a variety of somethings that people find valuable at four key price points. Campaigns that don’t have an enticing reward under $20 fail 72% of the time. Your book or album, or tickets to your film or show, are the perfect perk at this price. Some people are willing to pay above market value to help you out – but many are not. You’ll want to make the basic, no-frills version of your project available at market price. Autographed version of the project. If the book goes for $15, the signed copy goes for $25. Give one, get one. One for you, one for a friend! If the signed copy goes for $25, two go for $40. Artist catalog. Signed copies of not just the new book or album, but the prior two, too. Something commemorative. 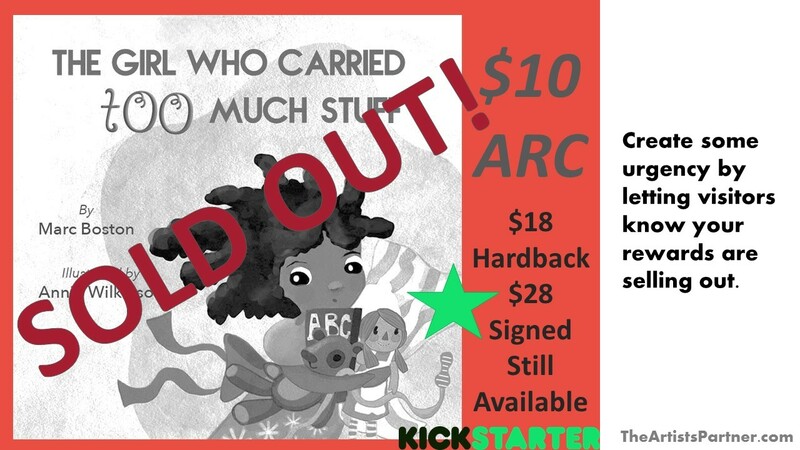 A signed, limited edition art print of the book cover, show poster, or illustration makes a nice option at the higher end. Plus a signed copy of your book, album, or playbill! Earmarked funds. Some people want to support you financially but don’t want anything physical in return. So, $25 for a costume hat, $50 for a set piece, or $75 for an illustration can help give your backers direct influence on the success of your project. Offer to give these backers credit on your webpage or in the liner notes. VIP Events. Host a brunch, dinner or cocktail party. VIP tickets to the premiere. A private concert or screening. A lecture and reading at a related organization. One-on-one consulting. A voice lesson, a manuscript review, photography clinic, or other consultation in your area of expertise that can be delivered in-person or via Skype. One-of-a-kind items. The original art from your book or album cover. A signed version of the script. A key set piece from the production. Producer credit. Backers at this level should receive thanks on the title page, liner notes, or playbill. Offer them space to commemorate a person or organization, promote their own project, or say a few other words. VIP treatment. Automatic red carpet entrance to premieres, parties, and events. Backstage passes and set visits. Signed copies of your project. Thanks on your webpage. Personalized rewards. A special, one-of-a-kind recording or video, or limited edition of your book. Project participation. Invite them on set or onstage. Offer a background part. Name a character after them. Get creative incorporating them into your work! On Indiegogo, you can select a “Featured Perk“. Typically, the perks go in numerical order by price. But you can pick any reward to be highlighted at the top! It’s usually a good idea to pick one over $20 and below $100 – perhaps the autographed version of your project. On both Indiegogo and Kickstarter, you should pick 1-3 rewards at varying price points that you highlight in the body of the campaign with pictures and descriptions. Check out RED’s Custom Jewelry for a great example of this. Anything that can help drive early momentum in your campaign is a big plus. Consider offering a limited number of “final drafts” of your project at an attractive price as an Early Bird reward. Rough cuts, test screenings, ARCs, and dress rehearsals make great rewards for Early Birds. Since the goal here is early momentum, not necessarily profit, these Early Birds should also get the finished version of your project as well. This is a great reward to feature early in your campaign – and also to feature as Sold Out when they’re gone! This helps to create the urgency for potential backers to “act now”, not put off pledging until the last day of the campaign. At the basic, no-frills level, you’ll probably not want to set a limit on the number of backers. But, it always looks great for a few rewards to sell out over the course of the campaign. Early Bird rewards (above) are a good example of this. Larger ticket items should almost always be limited edition, as that gives them the air of exclusivity. On both Kickstarter and Indiegogo, you can set quantity limits on any of your perks or rewards. You may also want to consider limiting the number of autographed versions of your project – how many of your books do you actually want to sit down and sign? If you are offering swag, what quantities are reasonable to manufacture and ship? Anything that will be a pain to fulfill in large quantities should have a cap. Neither Kickstarter nor Indiegogo offer a “shopping cart” for backers to easily purchase multiple items. It is set up for backers to pick just one. However, there are a few ways around this to make it possible for your backers to buy as much as they want. Bundled rewards. Offering a book at $15 and a t-shirt at $35? Make a book + t-shirt reward priced at $45 or $50. It’s also a good idea to have a little treat to include when you fulfill the rewards. Printer services can easily make up a magnet, pen, or stickers with your project images. For rewards you are fulfilling digitally, a set of computer wallpapers, photo gallery, or a little video or audio link can make a nice surprise thank-you. It’s always best to give your backers positive surprises along the way when you can! You can’t add in fulfillment costs after the fact, and you can’t change anything – price, description, delivery date – about perks or rewards after someone has pledged towards it. So it’s very important to make sure your price points cover manufacture, packaging, and shipping. 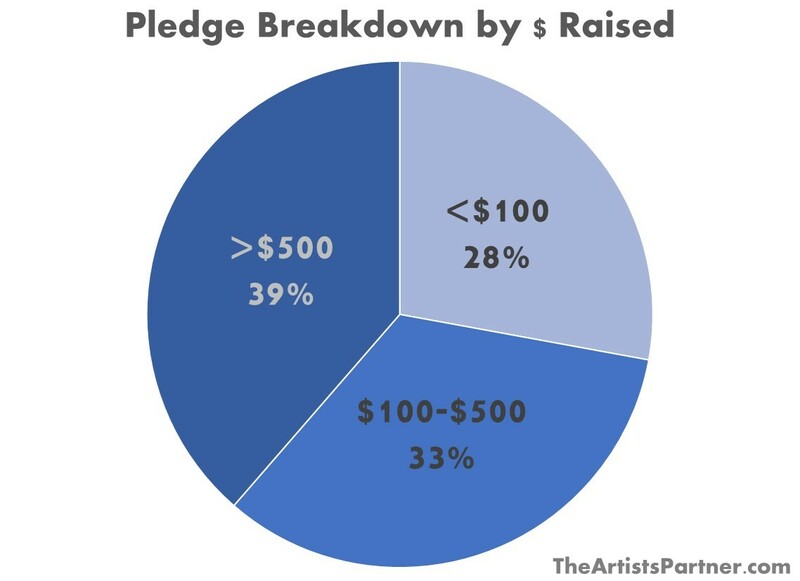 Crowdfunding campaigns have gone broke because of poor planning in this regard. This probably goes without saying, but you need to know your per-unit cost on your book, album, show seat, or good. If you are offering swag, you need to know your bulk costs and per-unit costs on those as well. While swag is fun, we generally dissuade our clients from overdoing it, as you typically need to order in bulk and will need high turnover to cover your costs. Kickstarter offers the option to add shipping costs by country. If you are shipping anything larger than a letter, it’s a good idea to take samples to the post office and get firm figures on shipping costs to countries where your backers are likely to reside. Indiegogo does NOT offer the option for customized shipping costs. You’ll still want to visit the post office, but then you’ll need to back those costs into the price of the perk. Kickstarter and Indiegogo ask you to input your estimated delivery date. We usually advise our clients to give themselves an extra month or two. There are often delays in production. And fulfillment itself can take longer than expected – you’ll have to collect all your backers’ shipping information – so it’s better to under-promise and over-deliver. 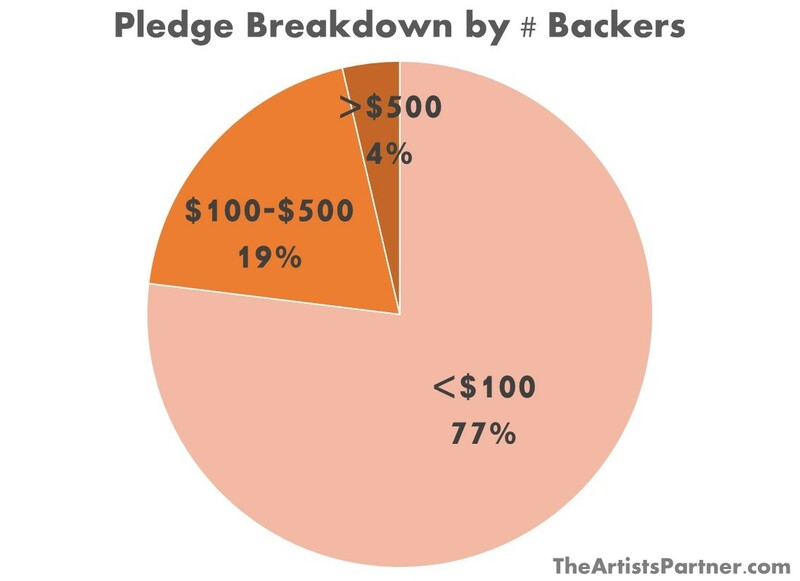 Kickstarter has the strictest rules. Investments, charities, contests, coupons, raffles, lotteries, alcohol, and other prohibited items may not be offered as rewards. Indiegogo has laxer rules (please see our post on Kickstarter vs. Indiegogo for more). In particular, in contrast to Kickstarter, charities and non-profits are welcome. However, investments, contests, raffles, lotteries, alcohol, and other items are prohibited. Offer rewards for less than the cost of manufacture, packaging, and shipping (in particular, beware of swag). Offer unlimited quantities of rewards for which realistically there is only a limited number you can fulfill. Back yourself into a corner on your timeline for delivery. Leave out key price points. Have something great at <$20, $20-$100, $100-$500, and $500+. Assume everyone will be willing to pay over market value to support your project. Assume no one will be willing to pay over market value to support your project. Offer rewards that distract from your campaign. Violate Kickstarter or Indiegogo policies on what can be offered. If you would like a free crowdfunding analysis of your project, please fill out our Artist Questionnaire. We typically respond within two weeks. We look forward to hearing from you!